Well, I feel fully recovered from my little 12-hour (almost 37-mile) jaunt two weeks ago. I think the 24 hours of lost sleep have been filtered back into my regimen, and I have zero residual fatigue and muscle strain. Even the wonky heel feels (almost) brand new. But, that angry hammy/glute/piriformis thing is still not as happy as the rest of me. It's not debilitating, but it certainly is there taunting me every time I've been tempted to "cheat" on my recovery. Rest assured (pun intended), I have been a good girl. In fact, I have logged a whopping (cue the drum roll) 12 miles, post-ultra! And, I'm completely good with that. I have been running for more than 11 years, and have been a distance runner for the past 8 of those. I will not lose much (if any) of my fitness or endurance by taking a couple weeks easy. I have learned that one needs to do less of that which we love in order to be able to continue doing it long term (say that 3 times, fast!). Anyways, I have been doing quite a bit of cross-training and walking, though. I did sneak out for a couple miles last Monday (#nevermissaMonday), but that was it for mileage in the running shoes until Sunday morning. Yes, you read that correctly....no mid-week miles (again). I also went for a rather fast-paced walk on Tuesday. 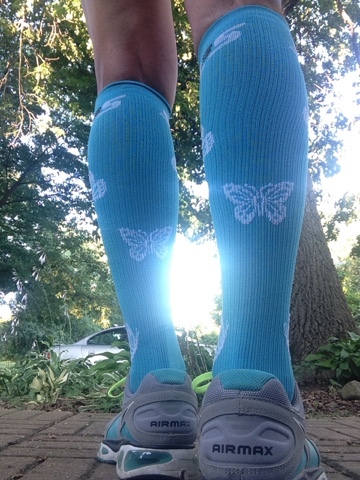 I have been testing a new pair of compression socks, the SLS3 Butterfly Compression sock...and I love them! They have been great for my post-ultra recovery (you can read my review HERE). 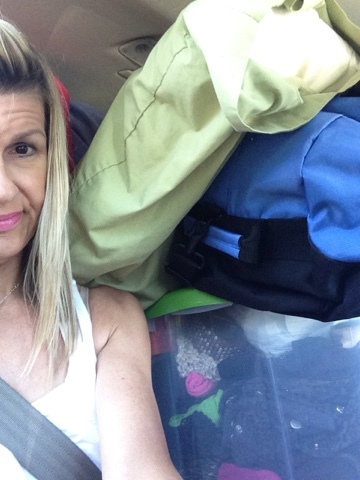 This will not become a habit, but there have been some other things happening......like our daughter moving to Pennsylvania. Yes (you read that correctly, too)....Pennsylvania. Like 17-hours away by car (not that we were keeping track or anything). She's our oldest, and she graduated from college back in early May. She's had several job offers, but this one enticed her the most (and she was eager to spread her wings and get out of Iowa). I took Wednesday afternoon off (as well as Thursday and Friday) from work, we loaded up our SUV, and hit the road around 2:30 in the afternoon to begin our journey out east. We left the other two kids in Iowa (both had to work...and there wasn't any room for them). We thought about renting a truck or a trailer, but the daughter has temporary lodging at a hotel until she's allowed to take possession of the townhouse she bought (yes....you read that correctly as well). We'd have to arrange for storage somewhere and essentially she'd have to move all of her stuff twice....so we elected to bring a lot of her clothing, non-perishables, and basics on this trip and make a return trip Labor Day weekend with all the big stuff when she'll have a more permanent place to put everything. 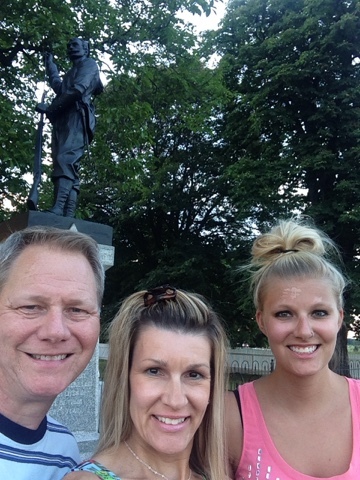 We spent the night in Dayton, OH and were up bright and early on Thursday (sort of bright, but definitely early) and on the road, Gettysburg, PA bound. She starts her new job on Monday, so we had a very limited time frame to get several details done...including finding a car. Once we arrived in Hanover (where she'll actually be living, not too far from Gettysburg...where she'll be working), we scoped out car dealerships. She found a Nisson Altima that she really liked, but we wanted to check out a few more options the next morning (Friday) as well. I brought along my running shoes, in hopes of running a few miles on Friday morning, but our hotel was located on a busy highway (with no sidewalks), so I elected to stay inside our room and do some strength work (there wasn't a fitness room or I might have considered treadmilling a few miles). I did five sets of push-ups (20) interspersed with squats, and lunges, and also a 4-minute forearm plank thrown in for good measure. 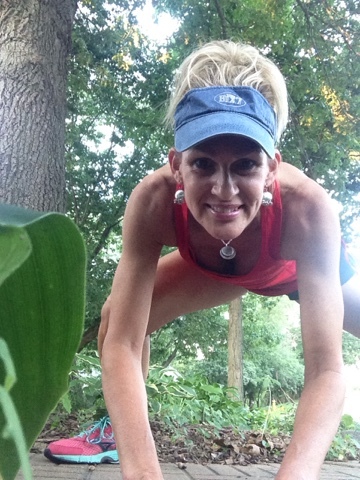 Squats, push-ups, and planks...Oh My! We headed to another car dealership, and test drove another option. It was there we learned that she'd have to have a Pennsylvania drivers license in order to register her new car in the state of Pennsylvania. So, we then headed to the PA DMV....where we were told she could not get a Pennsylvania drivers license until she had established residency. Even with paperwork from the townhouse she'd bought, she still needed an actual piece of mail with her name addressed on it. Seriously ???? So, we returned to the Nisson dealership, so see what they would suggest she do, given her unique situation. It turns out our best option (short of the husband and I leaving our car with her and flying back to Iowa) was to register the (Pennsylvania) car in Iowa, so it would match her current Iowa driver license...and after she has moved into her house (after the inspection, closing, etc.) she could then apply for her PA driver license and then transfer the registration of her (still to be purchased) vehicle. Kind of lot of extra leg work on our part, but that's what our situation required (and we had - foolishly- thought it would just be easier to wait to buy a car in PA to avoid having to transfer the title and registration...ha!). So, after much negotiation, stress, and problem-solving, we arrived at a happy solution (albeit not the most convenient). The daughter will be starting her new job, with a vehicle to drive, and a townhouse to call her own. Not bad for someone who graduated from college less than two months ago. 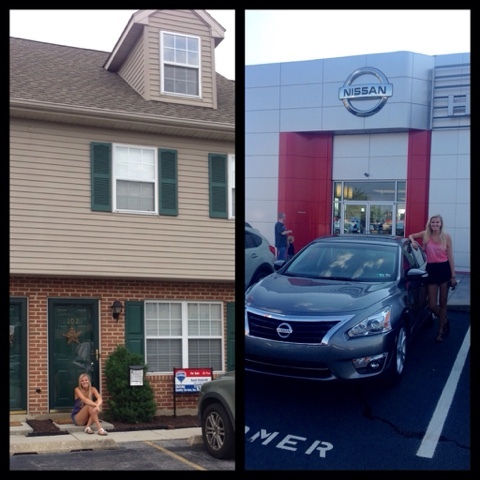 Her first house and car...welcome to adulthood! 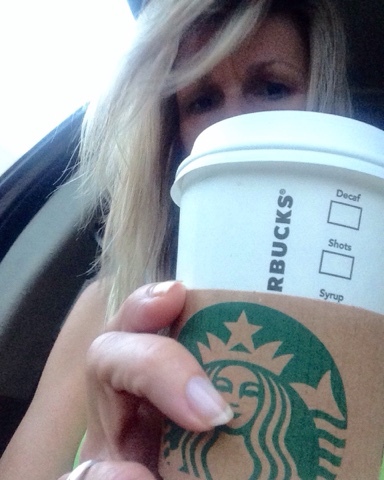 Saturday morning started with a 5:00AM departure for the husband and myself. We said our see-ya-soons (along with several hugs and many tears), and we began our journey back to Iowa. 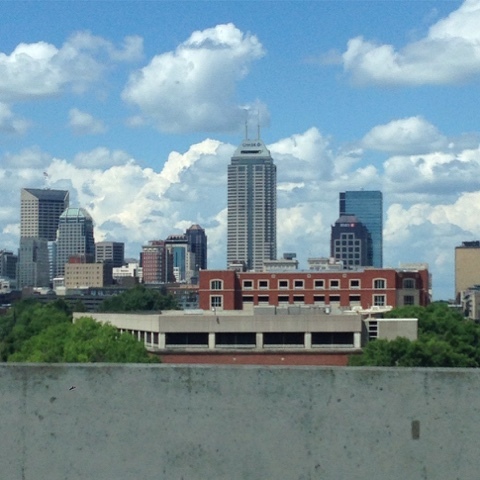 And, as we drove through Indianapolis, I couldn't help but admire the skyline. There were several tall buildings, and I couldn't help but think to myself, "Yep. I could climb those!" We arrived back in our driveway around 8:30PM Saturday night. I had everything unpacked, did a few things on the computer, and headed to bed. Sunday, I finally laced up the (dormant) running shoes and headed out for a few miles. After spending the past four days cooped up in a car, my legs felt like lead. The temps were warm and humid, but it felt great to get some running done. While in Hanover, we were told the Famous Hot Weiner was THE place to go for lunch....so we checked it out. And it was awesome! 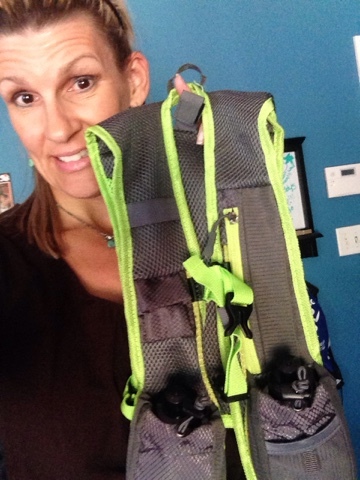 I received a hydration vest pack recently, so this is my next item to test out and review. Stay tuned, this is gonna be fun! So, that's a wrap. Crazy stuff, huh! Let me just say...stress is over-rated (as is sleep). Have you ever relocated to a new state and had problems with getting a driver's license or registering a vehicle? How old were you when you bought your first home? 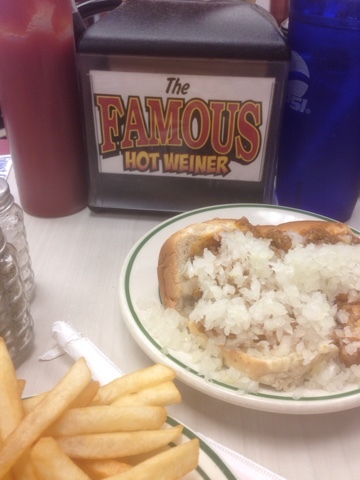 Ever eaten at The Famous Hot Weiner? 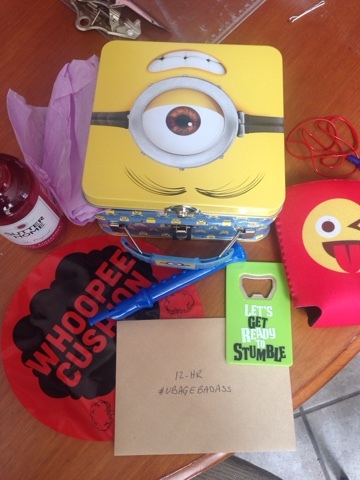 As usual, I'm linking up with the ever-awesome Holly from HoHo Runs and Tricia MissSippiPiddlin for the Weekly Wrap. Do head over and see what everyone's been up to!! 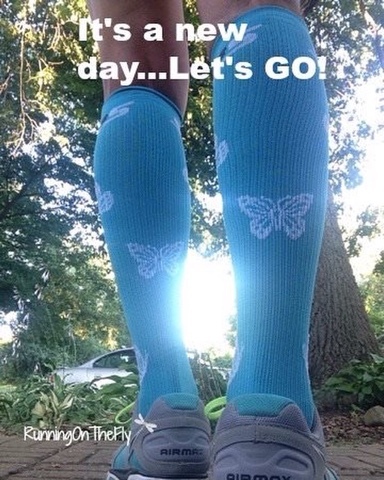 More specifically, let's talk about compression socks. 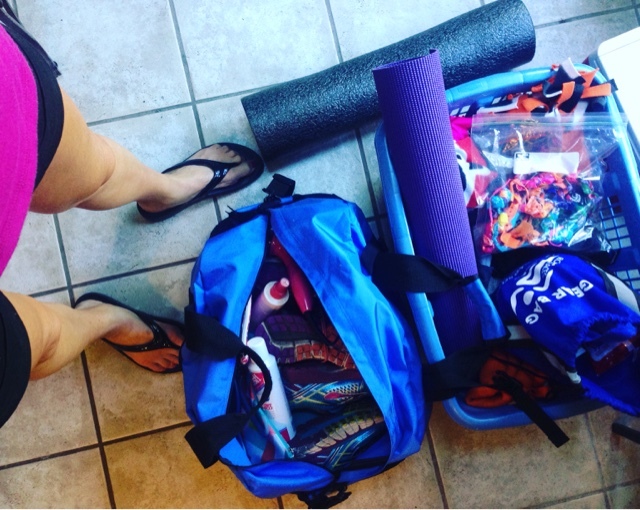 Have you ever utilized compression for performance or recovery (or both)? 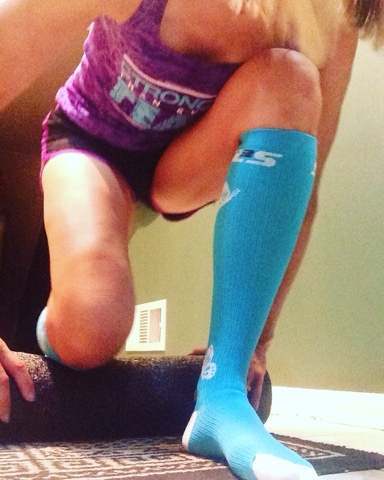 I have been a die-hard lover of compression sleeves for a few years. I have worn them during running/racing (usually anything over 10+ miles). In all honesty, I cannot tell if they make a difference in my performance or not (but they look pretty badass!). I love them for recovery, though. 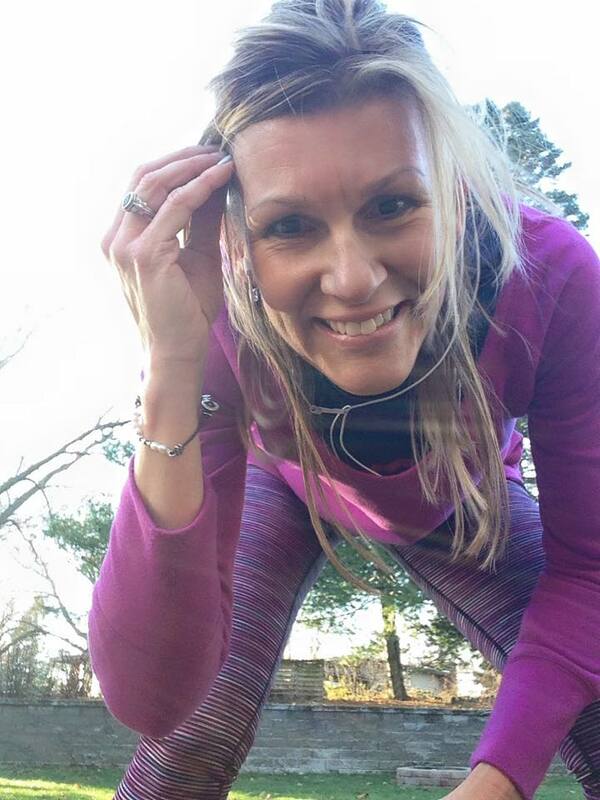 It seems when I do a long run, there will usually be some post-run water retention and muscle aches (and it typically won't show up for a day or so later). 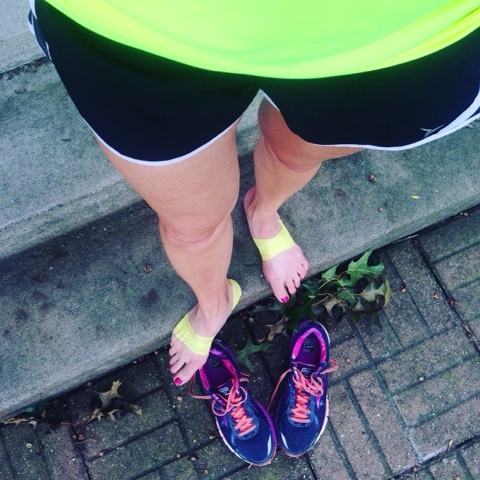 Sliding on the compression helps alleviate some of the post-run discomfort because it keeps everything nice and tight so the circulation keeps doing it's thing with minimal swelling. 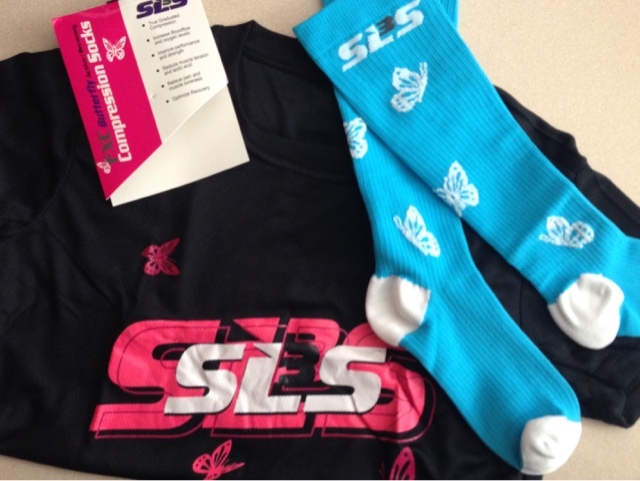 I was given a pair of SLS3 FXC Butterfly Compression Socks to preview and test. My first thought was, "no compression sleeves?" My second thought was,"try 'em out anyways." I have other full -length compression socks already in my arsenal, but I prefer compression sleeves (because I'm totally in a committed relationship with my SmartWool no-show socks). But I was willing to give these pretty socks a try. 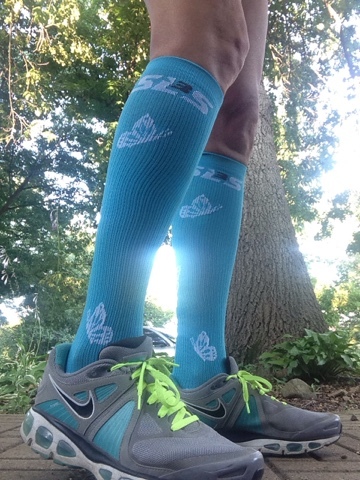 I wore the SLS3 FXC Butterfly Compression Socks for a race recently. 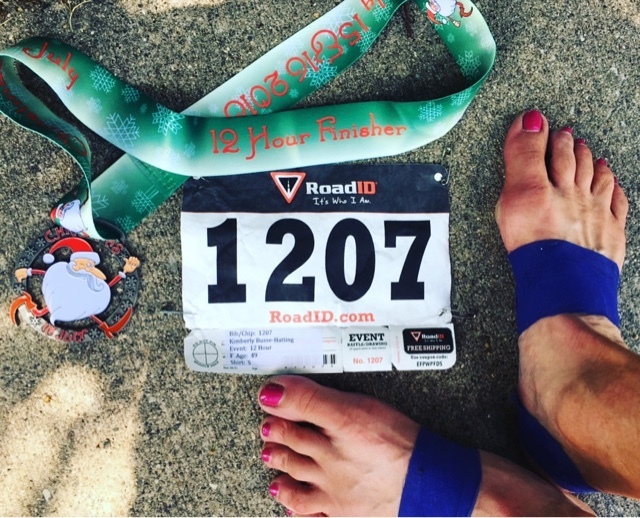 The race itself was almost a train wreck (recap HERE ), but I think the compression socks helped ease some of my discomfort. 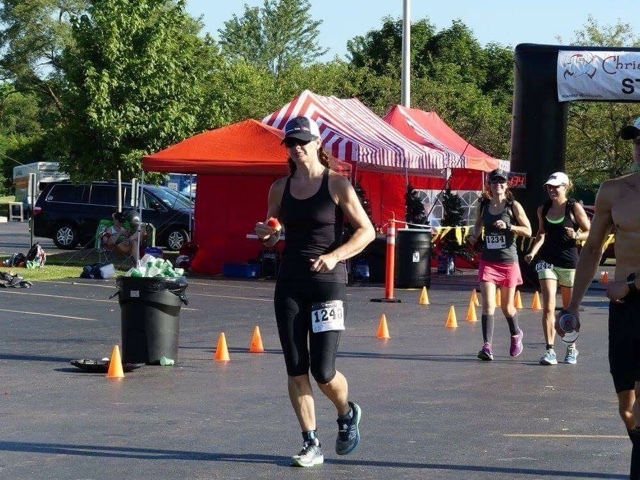 It was one of those races where the body and mind were NOT in sync; I was experiencing some unexpected glute/hammy/piriformis discomfort and my gait and stride were compromised (big time). We've all been there. Unexpected aches and pains often lead to a compromised running form, which (in turn) leads to discomfort elsewhere as your body attempts to "right" the situation. In other words, your body (in its survival-mode mentality) will usually over-compensate in other areas as a means to protect the first-affected pain source. So, yeah, my entire body (from the waist-down, at least) was not feeling too good at that race. The extra support of the socks probably enabled me to stay (somewhat) vertical. I also have been wearing the socks as a means of recovery from my recent ultra. I did not wear them for the race, but I wore them several times in the week following, mostly overnight. Let me just say that we had some major hot (and humid) weather last week in Iowa.....and I did not experience the typical post-race swelling like I usually do. Granted, there was a tiny bit of puffiness around my ankles, but it was substantially less than usual, even with the crazy hot weather. Overall, I was very impressed with the fit of the SLS3 socks . I wear a size 9.5 shoe (10.5-11 size running shoe), and the size S/M fit great. I'm also tall (5'9), and the length was perfect for my long legs (a lot of knee-length socks come up short on me). I have seen some reviews where others thought the sizing ran a bit large, but it worked well for me. It wasn't quite as fitted in the toe region (as elsewhere), but I liked that feature because I can't stand the way other compression socks seem to crowd out my toes. Although I prefer compression sleeves over full socks, these were legit. Truth be told, full socks are probably better than sleeves (at least for recovery) because they provide support for the entire length of your leg (below the knee), including your ankle and foot. As much I like my sleeves, they stop at my ankles...leaving my entire ankle and foot "on their own." What do you think? 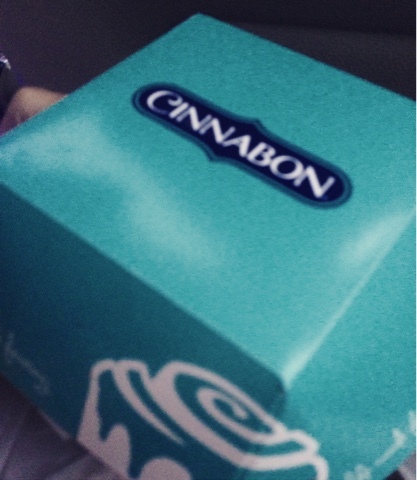 Need some for yourself? You can find them HERE . 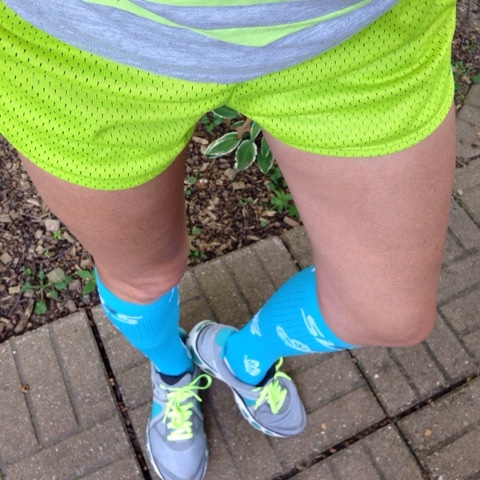 What do you think about compression socks or sleeves? Yay or nay? 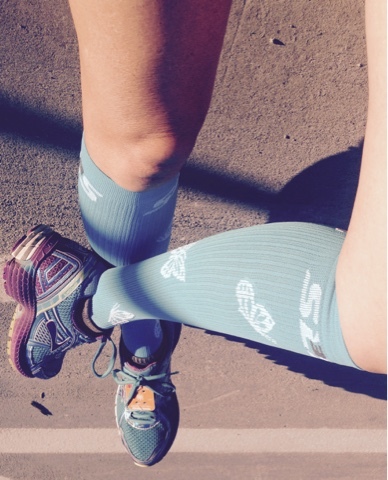 Have you worn compression socks/sleeves for exercise or recovery? ***Disclaimer*** I was given these socks in exchange for a review. All opinions are my own, and I do not receive any compensation for referrals or potential sales. 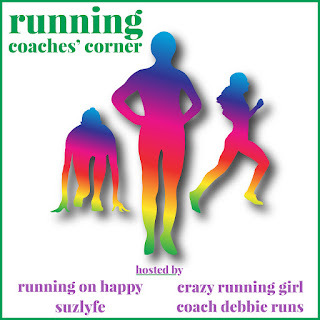 Also, I'm linking this with the Running Coaches Corner...head over and see what Running on Happy , Suzlyfe , Crazy Running Girl , and Coach Debbie Runs have put together for this week's link-up. Rest. Recovery. Reflection. It's part of the process. 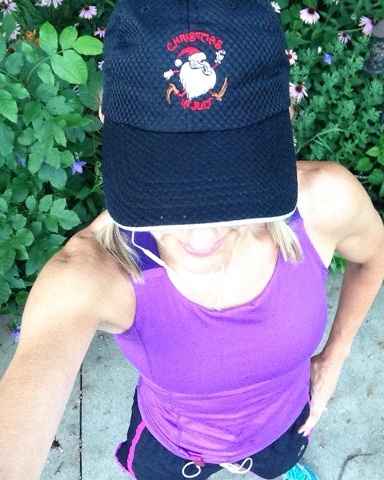 As is my typical Monday, I did sneak in a (not-so-quick) #nevermissaMonday run. It actually felt pretty good to be back in my running shoes, albeit for only 10-ish minutes. This recovery is not my first rodeo, and I know I'm not as recovered as I'm feeling (thank you, Beautiful Endorphins!). I promised myself I'd take some time off and be a good girl. Granted, I'm still doing my July Daily Challenge stuff (most days), but I've stayed out of my running shoes. After all, I have the Route 66 Marathon happening in November...which means training will officially start soon. It's best I start the training cycle fully recovered, right? Like most big races, this ultra left me in a thick cloud of endorphins (seriously, even after an entire week, I don't feel like I've landed back on Earth yet). 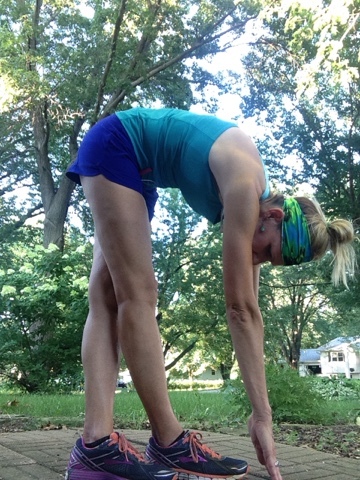 I had some stiffness in my hip flexors Sunday morning (the day after), but Monday was low-key. I didn't really notice much for DOMS (delayed onset muscle soreness) until Tuesday morning....but the aches and pains were at the absolute minimum. Keeping the DOMS at bay...foam rolling and compression! Usually when I do an especially long run (or race), I don't notice any any after-effects until a few days later (you know, about the time I start thinking I've escaped any after-effects). My biggest post-long-run annoyance is water retention, which is (ironically) usually a sign of dehydration. I have skinny, bony ankles...so if there's any swelling, that's the first place I notice it. I did notice some slight signs of "cankles" on Tuesday and Wednesday, but nothing like I usually experience. 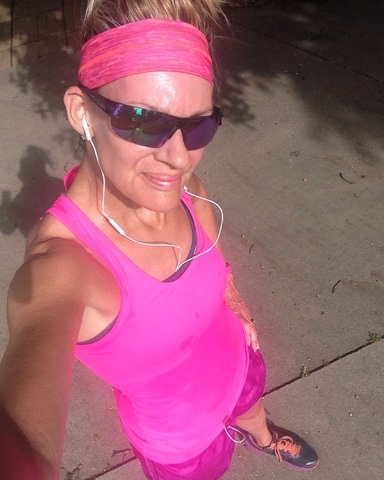 I really got lucky with the timing of my recovery because the weather this past week was very hot and humid....I didn't have much guilt or remorse staying inside. I met up with a friend on Wednesday evening, and we went for an hour-long walk. You know it's hot when you return home from "just" a walk and look and feel like you just ran a marathon (can you say, "sweat equity?"). The endorphins certainly had me in a state of awake & alertness (and some blissful giddiness as a bonus). As noted, my ultra began at 11:00PM on Friday evening, and concluded at 11:00AM Saturday. There was a campsite to dismantle, congratulatory high-5's to share, good-bye hugs and a quick shower before I met up with my sister for the journey back to Iowa. I dozed off for a couple of 10-15 minute snoozes, but that was it. 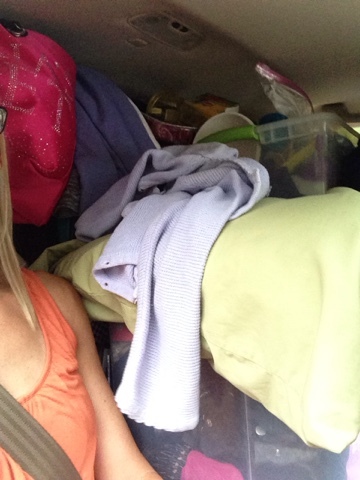 Upon returning home, I did a quick unpack/repack and got into the husband's car for another long drive to his hometown (family reunion). I didn't even sleep much in the car, Sunday afternoon, on the way back home. Throughout the week, I slept very soundly every night, but still awoke at my usual time (5:15-ish). I was pleasantly surprised how life resumed without any glitches following the 12 hours of my ultra. I kept waiting for the "crash" (and state of zombie-like existence), but it never came. Anything (recovery-wise) I did differently? I'd say the only thing I did (somewhat) differently is the use of compression socks instead of my usual compression sleeves. I did wear compression sleeves after I finished my race....Saturday afternoon, evening, and most of Sunday as we traveled home. 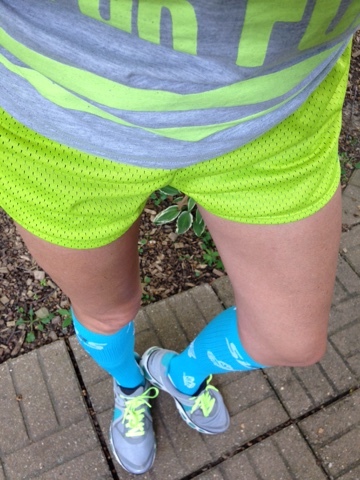 Sunday evening, though, I switched to full compression socks. As mentioned, I anticipated Monday and/or Tuesday would be the expected arrival of the DOMS and subsequent swelling....so I opted to go with full socks to keep my ankles fully supported. I didn't wear the socks during the day(s), but did wear them to bed every night for most of the week. It may be a coincidence, but given the extreme humidity and adverse conditions (with the weather) and LACK of post-race swelling, I think the compression socks helped substantially. I finally ventured out Saturday morning for a 5-miler. 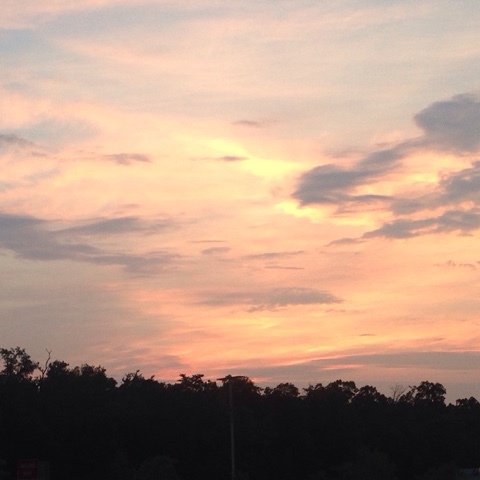 It was horribly hot and humid already at 6:45AM. The angry hammy was still a bit grumpy, but for the most part it cooperated. I never know if it's just an injury/issue I will always have or if the humid weather brings out the worst of it. None-the-less, I returned home looking (and feeling) like I'd just been submerged in a nasty pond. A friend also talked me into (without much coercion) meeting up a bit later for an hour of water walking at the pool. I had never "water walked" and was amazed at how hard it was (I hope I didn't look as awkward as I felt!). I could actually feel sweat running down my back while IN the water. So, the Ultra feel-good mojo is still in my system. It truly was a great experience, and I'm thankful how it all played out...at the event itself and with the recovery. And, I'm already thinking ahead to 2017 and returning to do the 12-hour event again (#truth). 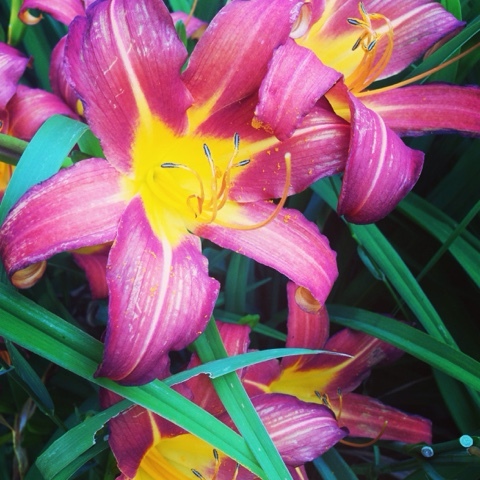 The flowers in my yard have been loving all the hot and humid weather...I especially love all of my lilies! Yes, I wear athletic tape to keep my arches feeling good (and my heels happy). Sometimes the tape matches my outfit. 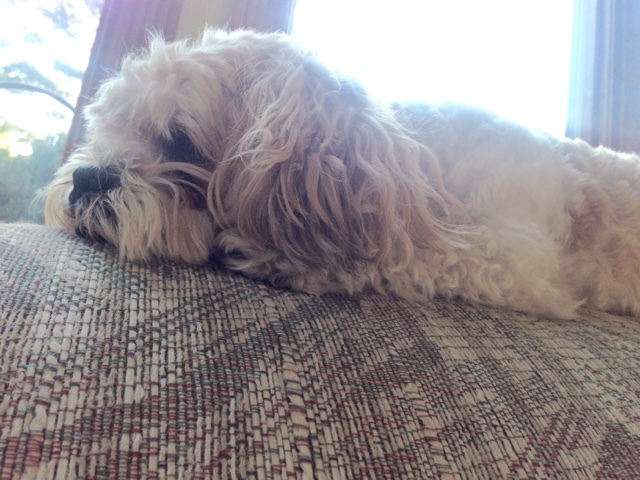 Isn't he cute, perching atop the couch like a cat? 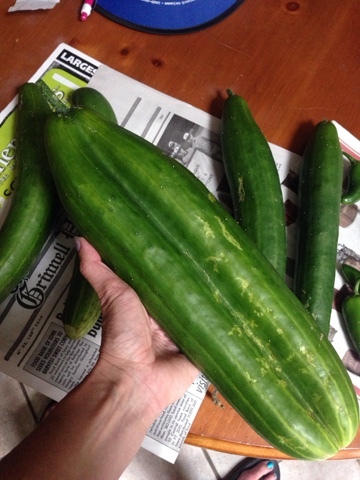 And, lastly, check out the size of this cucumber from my garden! Yowza! So, that's a wrap. 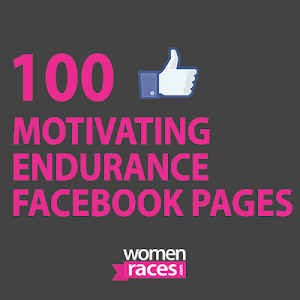 Have you ever had a surprisingly easy recovery from a challenging race or training run? How many days off from running do you give yourself for recovery? 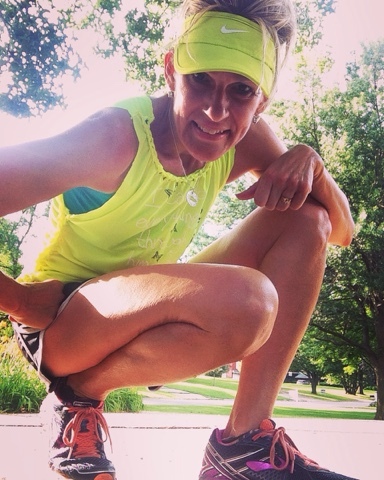 Do you ever have issues with swelling/water retention after a race or long run? Have you ever had a garden? I'm linking up with the lovely ladies Holly (from HoHo Runs) and Tricia from MissSippiPiddlin ) for the Weekly Wrap. This "little link-up" has become a major weekly event that I look forward to each weekend. There's all kinds of great reading from LOTS of bloggers. Do head over and check it out!! Ultra-marathoner. Doesn't that have a nice ring to it? I can officially call myself an Ultra-Marathoner (again)! This was such an amazing experience. It's absolutely surreal to grasp the reality of knowing I did it. But I crossed the finish line, and I have the swag to show for it. And, several days post-ultra, I'm still basking in the sweet essence of endorpohins. 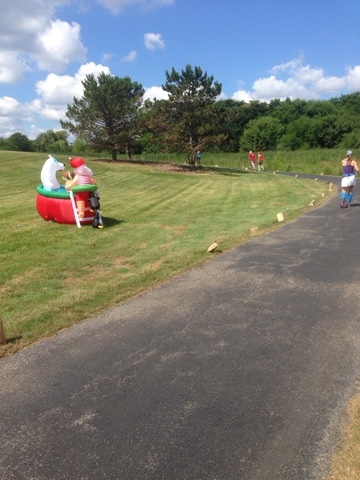 The Christmas in July Races are put on by a local group, Runners 4 Wellness, and take place at the Lisle Community Park in Lisle, IL. This was only the third year, but they have the details of this event down to a near-perfect science. 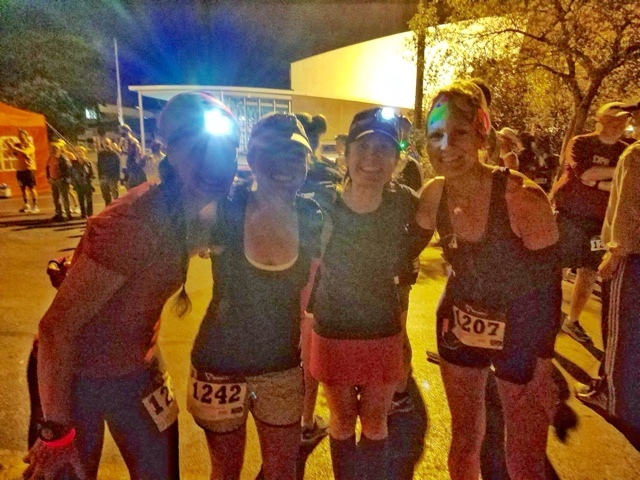 Last year, myself and six other runner friends (Team #UBAGE...UltraBadAssGirlsExtravaganza) took on the 6-hour endurance race (recap HERE), and several of us returned last weekend to try our luck at the 12-hour race instead (seriously, it seemed like a good idea....). The 12-hour race began at 11:00PM (that's right, in the evening!). I drove from Iowa (along with my sister...who would be my chauffeur for the return trip, post-finish line) and arrived at Penny's house around 3:00 Friday afternoon. Penny is a gal I met a few years back when both of us were training for our first marathons. We've since become good friends, and have done other races together (including last year's CIJ 6-hour). We had plenty of time to finish getting our gear organized, strategize on the race ahead of us (fueling, rest periods, pacing, etc.) and relax. We arrived at the race site around 9:30PM, and met up with the other gals...Maggie and Michelle (who also had run the 6-hour with us last year) and Jamie and also Michelle's hubby, Michael. Both Jamie and Michael were running the 6-hour (which didn't begin until midnight). We set up a tent and an overhead awning for our "campsite." 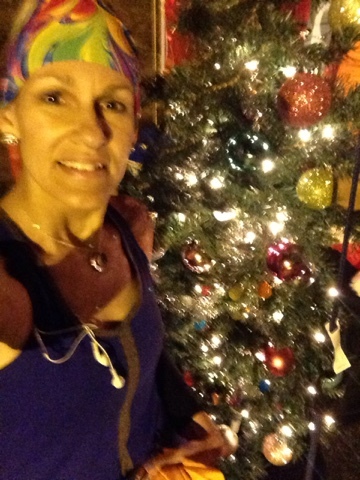 One of our #UBAGE gals from last year (Teri) was not able to run it this year, but she was there to see us at the start line and would be returning in the morning, to volunteer. We had plenty of time before out 11:00PM start time, so we walked around and took a few pics. 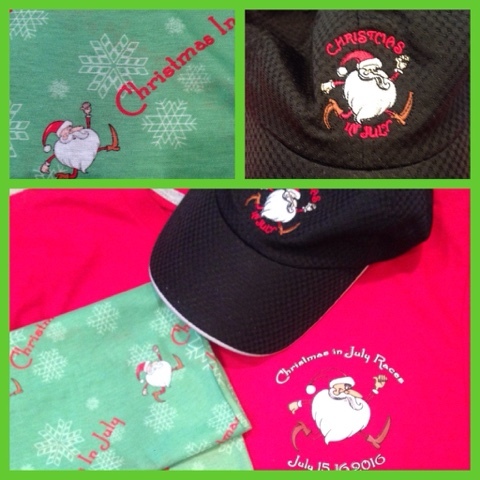 There was a bigger-than-life Santa! Before long, we were called to line up. After a few instructions from the officials, we were off and running! The four of us hung together for the first several miles, very reminiscent of last year. What was very different this year, though, was the weather (temps in the mid-60's as opposed to upper 90's) and a clear sky (instead of dark cloud cover with occasional lightning bolts and thunder...which later turned into an all-out downpour). A unique feature about this event is the course. 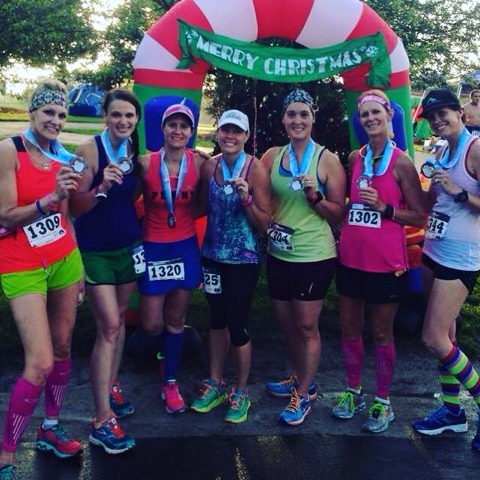 Instead of running through city streets, open trails, or looping around town, this course has a 1-mile route (technically, it was .973) that we had to run repeatedly, as many times as we were able, within our 12-hour time limit. There were luminaries all along the route to light our way, several blow-up displays and occasional lighted Christmas trees. 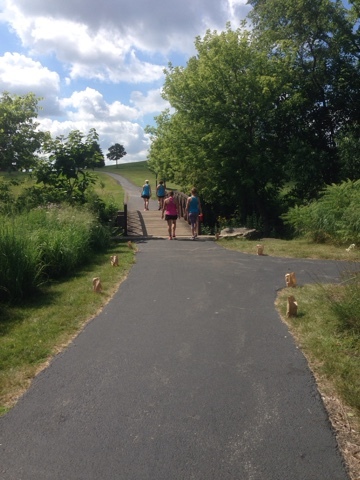 The route started out along a street (on the sidewalk), then turned onto an asphalt trail that twisted and turned around a lake (involving a bridge). There was a long, curved path up a hill (that didn't seem as treacherous this year), followed by a sharp 45-degree left turn (which was just as bad as I remembered it) that took us back along more curves towards our "campsite," then along the numerous aid stations and, finally, back to the start line. Every time we crossed the start line, our ankle timing chips chirped and our laps were recorded...and we would began the entire route again for each subsequent lap. The first miles went fast. 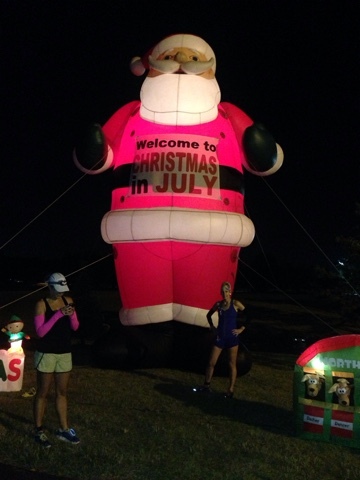 Before long, we were closing in on our 6th lap and the 6-hour runners were ready to start their race. Although my angry hammy was feeling alright, I knew I would need to pull over and walk. 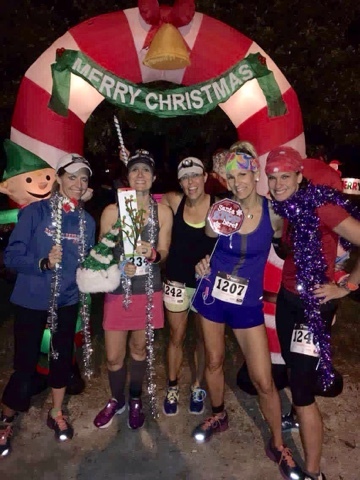 I had not trained with any of these gals, so their pacing and fueling intervals were not in sync with what I'd need to do to keep my hammy (and, potentially, my healing heel) functional. And that was alright. We'd never be more than a lap apart, so I knew I'd be seeing them several times throughout the race. After my 8th lap, I decided to stop and stretch for a few minutes, and pull on the compression sleeves. I have not come to any conclusions as to whether or not the calf sleeves help with my running. My calves, though, were already feeling a little bit of strain from having run that hill eight times. I was pretty certain the compression sleeves wouldn't hurt. I finished my 10th lap with exactly two hours showing on the clock above the timing mat. I ran another lap and decided to lather on some Biofreeze while I waited for a turn at the porta-pots. The hammy was still feeling a bit strained, but I could tell it was loosening up. I decided to walk the 12th lap and do some intermittent massaging. I hadn't seen any of the gals since I'd broken away from them (around the 7-mile mark), so it was a welcome sight seeing Michelle somewhere in the middle of the lap. She was going strong! I also saw Jamie a short while later. That little walk reprieve was just what I needed. I grabbed some water and Coke at the aid station and started back into a comfortable run and caught up with Penny and Maggie for awhile. 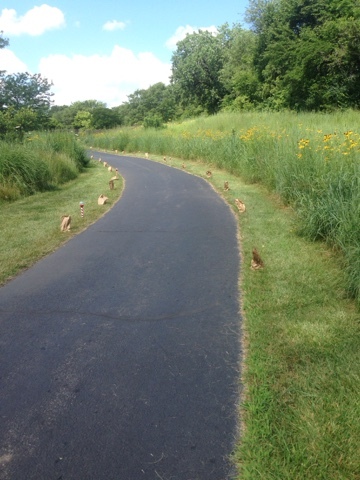 They were going strong as well, and I think they were two laps ahead of me on their mileage count. I noticed the clock showed three hours of elapsed time as I finished my 14th lap.I continued on for a few more laps before deciding to take another walk break for the 17th lap. I also stopped at the campsite and popped a couple of Aleve and spent a few minutes foam-rolling my legs. All along, I had the plan of making it to 20 laps (which would be just under 20 miles for distance), and then I could walk as much as I wanted. The clock showed five hours as I finished that 20th lap. My distance goal for this event was 35 miles (which means I would need to complete about 37 total laps). Having done 20 laps within five hours gave me a huge wave of relief! I was well past the halfway point of my distance and still had another seven hours remaining on the course. I decided to walk the 22nd lap, and paused for some more Biofreeze (more as a precaution than a necessity) after finishing the 25th lap of the course. A couple laps later, I caught up with Jamie. She had just finished her 6-hour race, and she did well...I think she completed 33 laps! She wasn't ready to leave, so her and I decided to walk a few laps together. By then, I was seven hours into my race and had finished 26 laps....so I was just about at the marathon distance. I was well ahead of schedule for my goal of 35 miles, so I thought a little break from running would serve me well. Jamie and I did a lap, and stopped at the campsite briefly. I decided to change shoes (I had brought along a second pair), and she wanted to stretch for a few minutes. We headed back out and wound up walking a few more miles together. These weren't slow, leisurely miles, either....we kept a good pace so my heart rate stayed up and my energy felt great. After that much-needed walk break with Jamie, I had a major energy resurgence. By now, it was around 7:30 and the sun was beautiful. A lot of people had changed clothes, so it seemed almost like a different crowd of runners were on the course. Teri had returned, and she was volunteering at the food stand, so I got to see her every time I came around the course and crossed the timing mat. I ran laps 30-34 with a decent pace. It finally hit me, around the 32nd lap, that I had gone my farthest distance ever...and I had officially conquered the 50K distance. I didn't cry, but there were definitely a few tears in my eyes as it became crystal clear at what I was accomplishing by doing this race. As I was about halfway through my 35th lap, I caught up with Penny and Maggie. 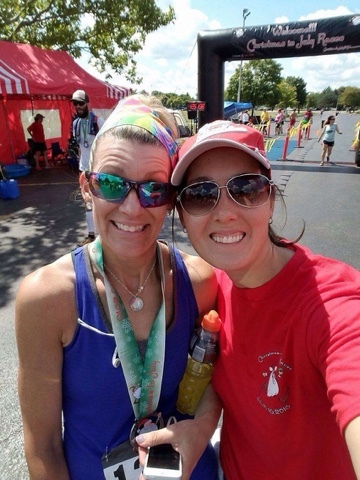 Their goal had been 40 miles, and they were about a lap away from reaching it. It was then that I realized I had been reading the timing clock wrong....I had thought it was almost 10:00AM, but it actually was only 9:00AM. I had been (ever-so-briefly) worried about getting all of my 37 laps finished before the cut-off, but I actually had an extra hour remaining. So, we decided to just walk and enjoy what we'd all accomplished. We finished that lap, and walked our final lap and called it good. We met back up with Teri (and grabbed more food) and even caught a glimpse of Michelle (who wasn't ready to stop yet). I walked over to the official's booth, to check on my mileage. Even though I had been keeping count all night (and morning), I had been awake for almost 30 hours...and there was a chance I could have miscounted. They were having issues with the timing system, and the results weren't yet syncing, they told me to come back in 30 minutes. Yikes! What if I had miscounted and didn't find out until it was too late? I would be devastated to find out I had only gone 34.5 miles....so I headed back out for one more lap. brought it along, to get a few pics of the course in the daylight. This bonus lap felt like a victory march. A lot of the remaining runners were now walking, and some of them had changed clothes. Almost everyone I passed (and those who passed me) had encouraging words and high-5's to share. This wasn't just my victory, but it was all of ours. Many of the people still on the course were fellow 12-hour runners, but there were also some 24-hour participants (who still had another 11 hours to go). When I finally made it around the final corner, Teri was waiting to hug me again. I saw the timing mat up ahead and made my way to it...for the final time. I still had another 30 minutes on the clock, but I decided all was well. I had done it! My total laps came in at 38, giving me a grand total of 36.987 miles! As I said, this experience was epic. 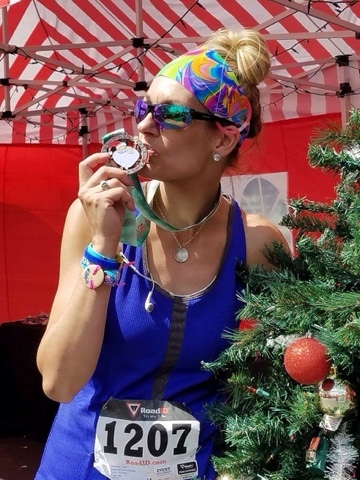 Even though I ran the 6-hour ultra last year (and technically did finish with a longer distance than 26.2), I had a hard time calling myself an ultra-marathoner. 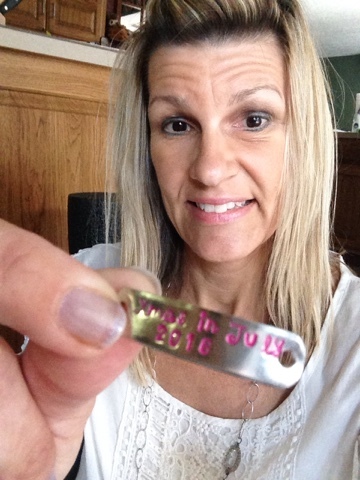 I did all the necessary work, but I came up short of my goal of completing a 50K last year. And that little "thing" has been hanging over my head ever since. Finally, I feel like I redeemed myself and can move on (not that I have any grandiose plans of running a longer race....yet). **The challenge of doing a 12-hour Ultra was physically demanding, no doubt, but the emotional aspect was much worse. No matter how fast the miles were going, it didn't feel like I was making much progress because of all the remaining time looming over me. Even when I reached the 20-mile mark (five hours into the race), I still had seven hours left on the clock. 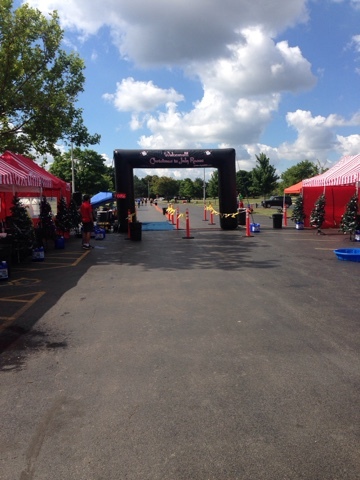 **The hill (just after the halfway point of each lap) did not feel as ominous this year. Could it have been all the stair-training I have done? (most likely) I actually ran it more than I walked it this year, and there were many times I actually forgot to walk it (as a means to conserve energy and save the hammy) until I was already 3/4 of the way to the top. 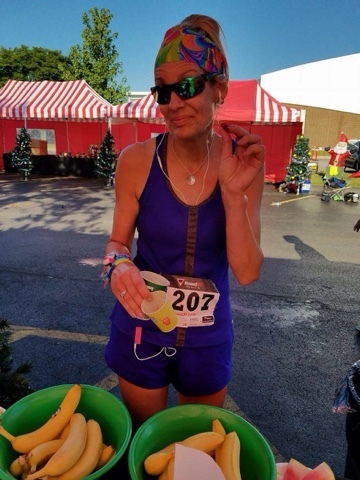 **All of my fueling was with "real" food (no gels, sport beans, waffles, etc.). Granted, there was an occasional half-glass of Coke or Gatorade, but that was it. The food spread was out of this world...we're talking pizza, pancakes, bacon, potatoes, tortillas, pretzels, fruit, etc. all through the night and it continued on for the duration of the event. **After breaking from the team (around the 7-mile mark), I was pretty much on my own, and it worked out well. There still were numerous meet-ups throughout the entire 12 hours, and many walk breaks with lively conversation. 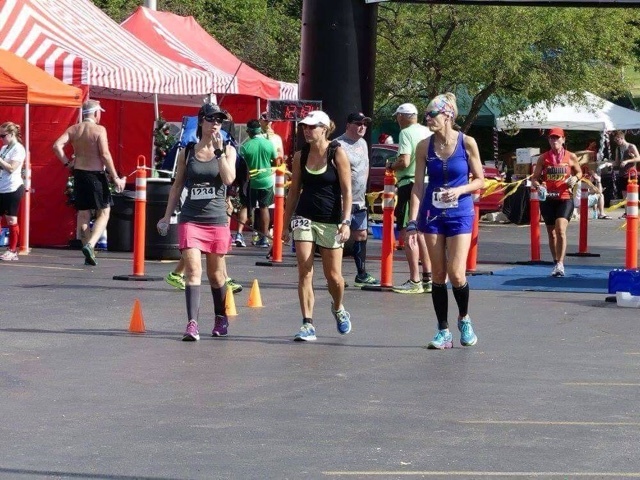 I had my own race to run (due to my own unique circumstances with my hammy and heel), but I still had all of their support and encouragement. ** The hammy was my main concern. It felt tight for the first 6-7 miles and periodically throughout the night. The brief pit stop at mile 8 (and the compression sleeves & foam rolling thereafter) made my situation much better. 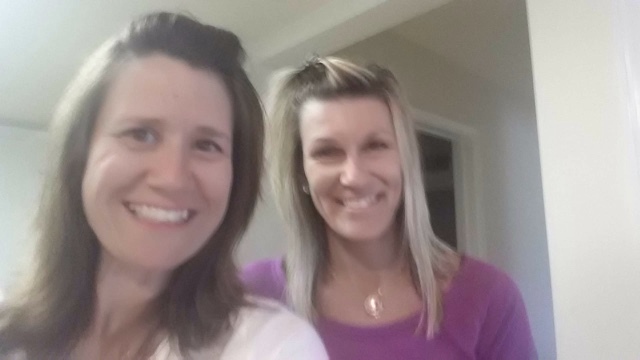 **I was pleasantly surprised how my energy stayed consistent throughout the entire 12 hours. I had a brief slump when I took that extended walk break with Jamie, but that was more as a precaution and not a last-minute remedy. 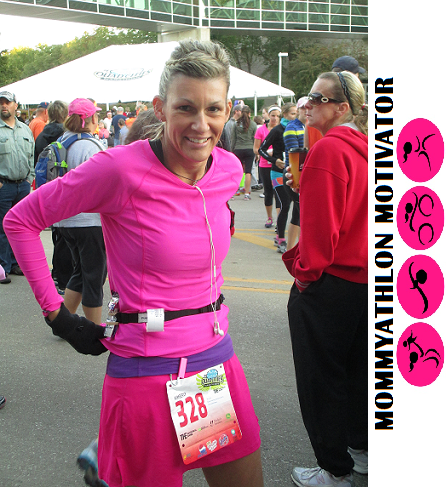 I never once felt like stopping, there was no proverbial "wall," and there were no tummy issues. All went remarkably well considering my training was less than desirable (due to the wonky heel) and my longest training run was only 17 miles. The spread of food was incredible! Overall, this event is one of the top-notch events I have ever done. There were some issues with the timing mat, so not all of the final results have been posted. But aside from that, the organizers do a FABULOUS job with everything else. 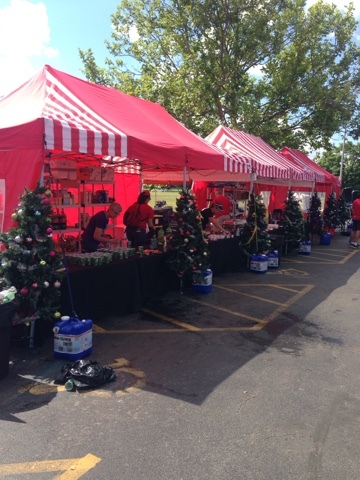 Great swag, awesome volunteers, well-lit (and decorated) course, and an awesome spread of food, fuel, and drinks. 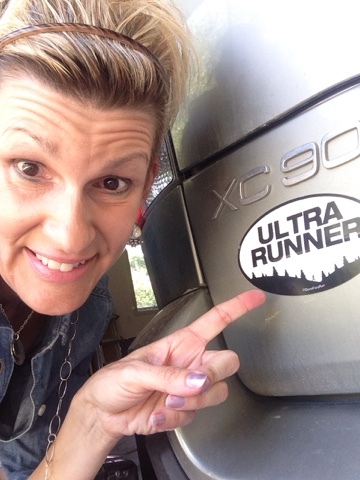 Have you ever thought of running an ultra? Ever attempted an over-nighter? 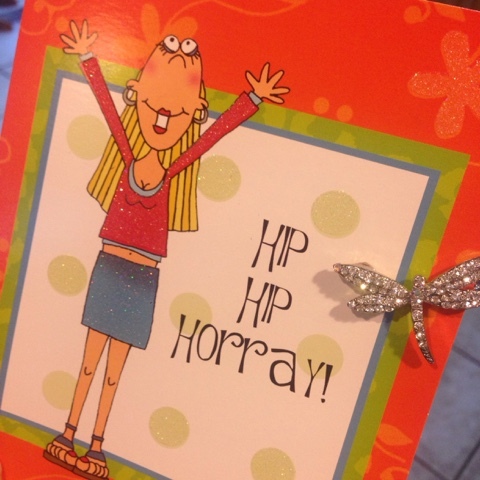 I'm linking up with Deb from Deb Runs for the Wednesday Word...this weeks word is Pragmatic. This ultra had all the makings of a pragmatic situation on many levels (my training, the 11:00PM start time, the 12-hour time frame, and the hammy/heel issues as of late), and it all played out to near perfection as a result. I got very lucky...could have been problematic instead. Also, I'm linking up Running on Happy , Suzlyfe , Crazy Running Girl , and Coach Debbie Runs for the Running Coaches Corner link-up.